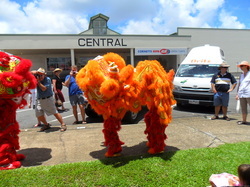 Innisfail towns-people enjoying the colourful sights of the festive dragons. All well-meaning persons whether they be local residents or travellers, are welcome as worshippers at the Innisfail Temple, irrespective of personal beliefs and ethnicity. The Innisfail Temple is an integrated fixture of the Innisfail townscape as illustrated in the photographs on this page. 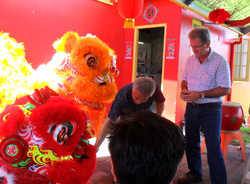 The future path of the Innisfail Temple has now been defined with the formation of Innisfail Chinese Community Ltd (ACN 152 640 045), and the integration of the Innisfail Temple and Artifacts under the umbrella of the Innisfail Chinese Community Ltd.
Several volunteers from the community are currently kindly offerring their services towards the upkeep and activities of the Temple and this is greatly appreciated. Additional volunteers are needed and are always welcome - just contact one of the Office-bearers please! The Deputy Mayor as official guest at Festive celebrations.